Hand painted pendulum clocks for a baby's nursery, child's bedroom or playroom. The clocks are available in several designs and colours, see option boxes for the full range of colours and designs.We can hand paint the name on the front of the pendulum and add a simple keepsake message on the back (see images). We also provide a battery which drives the pendulum and the clock. Size: 34cm long, clo.. These handmade pendulum clocks are a great addition to a girl's nursery, playroom or bedroom. 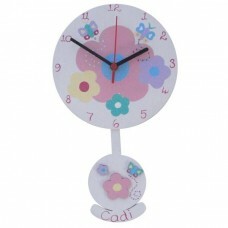 The clocks are available in a range of designs and colours ( see option boxes). Each clock can be personalised on the pendulum as shown in the images. A battery is supplied to drive the clock and the pendulum. 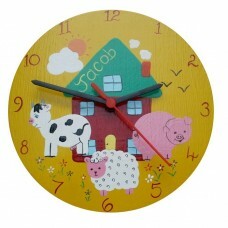 Size: 34cm long, clock face 20cm in diameter..
Hand painted brightly coloured wooden wall clocks for boys. 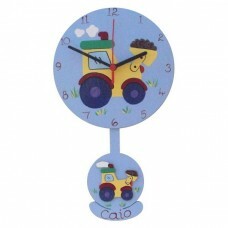 These clocks look great in a baby's nursery, child's bedroom or playroom. 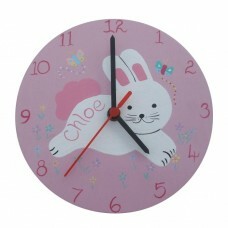 They are available in a range of designs and colours, see the drop down boxes for the choice of colours and designs.We can hand paint the child's name on the clock as shown in the images.Size: 20cm diameter..
Hand painted pastel coloured wooden wall clocks for girls. Choose your design and clock colour from the drop down boxes. A great personalised gift for a baby's nursery, child's bedroom or playroom.Size: 20cm diameter..